While spending time with Lord Stanley's cup I was in awe of the history. I don't know how to explain it. While going over the cup closely, inspecting and reading over the names of the victors, past and present, I was caught up in this feeling of nastalgia and pride. I wanted to photograph the cup in all it's glory. There are a few more shots I want to get and I will in a week or so. Congrats to the Detroit Red Wings for keeping the Cup where it belongs, here in HOCKEY TOWN. Sorry...the cup belongs in Philadelphia. Sigh, someday! 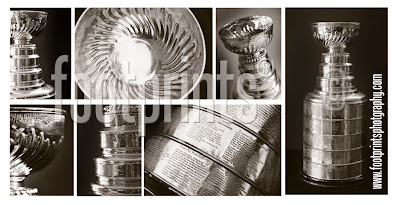 We saw the cup up in Toronto and kissed it...very silly:) Love the photos! Yes, there is a reason the D is called HockeyTown! Cool photos. Really cool. And the large image on the end totally works in the design.